The clients wanted to make some major changes to this en-suite washroom. The current bathroom had a small shower and tub combination that made for neither an enjoyable shower or bath. During conversations with the clients it became clear that neither one of them were bath people and what they really wanted was a stylish washroom with a functional shower. The clients wanted a rain head for comfort and a sliding shower arm for functionality and easy cleaning of the shower stall. 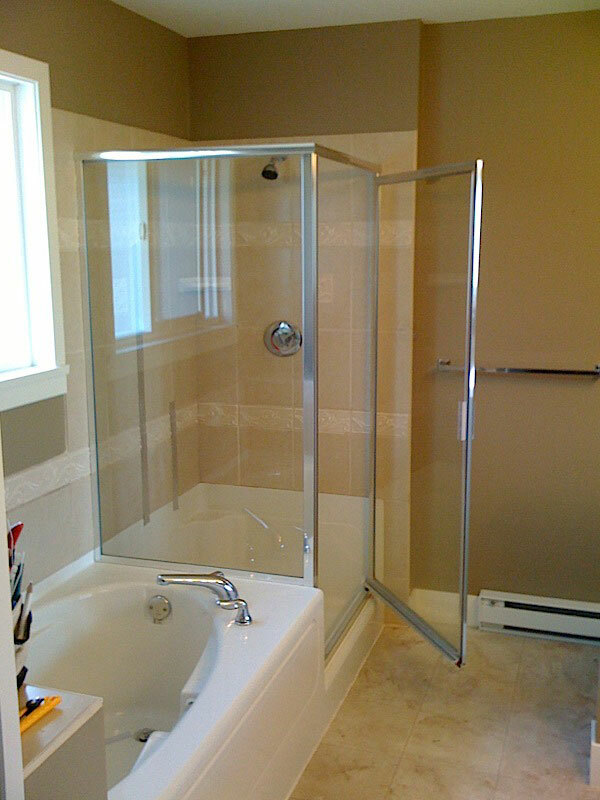 After Renovation : Glass shower stall with porcealin tiles and 2 way diverter. The clients wanted a vanity with a little bit of wow factor and as such they selected a solid wood vanity with a glass countertop. His and Hers mirrors, each with it’s own light were added to the bathroom to make the washroom as functional as possible as both clients left for work at the same time. The same glass tile that was used for the back-splash on the vanity was also used as a border in the shower area to provide continuity in the bathroom design. A Nuheat electric radiant heated floor was also installed underneath the tile to make the washroom as comfortable as possible.